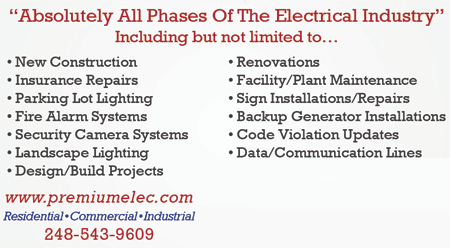 Premium Electric is equipped to handle all phases of Residential, Commercial & Industrial projects ranging from service work and renovations to new construction. Master & Licensed Electricians rank amongst the best in the State. We are ready to serve all your home & business needs. We are a member of ABC (Associated Builders and Contractors Southeastern Michigan Chapter) www.abcsemi.com and CAM (Construction Association of Michigan) www.cam-online.com.